Petrol price in DHANBAD today, Diesel price in DHANBAD today. Petrol price in DHANBAD today is 71.31 Rs/ltr. Petrol price has increased 0.18 Rs/ltr since 17th Mar when it was 71.12 Rs/ltr. Diesel price in DHANBAD today is 67.75 Rs/ltr. Diesel price has decreased 0.75 Rs/ltr since 17th Mar when it was 68.50 Rs/ltr. Here's a map with pump locations in DHANBAD. Click on a marker to check prices and get directions link. MAA MANGAL CHANDI SVC. STN. Want to use this data ? Click on the button below for the Newsrain API. Crude oil is the major raw material for petrol. At present, 75% of India’s crude oil needs are met through imports. And thus, international prices of crude oil and foreign exchange rates are the base components in determining the price of petrol at home. However, they form only a small component of the retail price, and the final price is determined by a host of other factors. In fact, more than 57% of the retail petrol price per litre goes towards taxes, duties, cesses and dealer margin. To understand the mechanism for pricing of petrol, it is first important to understand various stakeholders involved in the cycle from production to retailing of petrol and thus, determination of petrol prices. These are the companies responsible for produce oil in its crude form. There is a mix of both private sector companies like Reliance Industries, Cairn India Ltd, and public sector counterparts like Oil India, Oil and Natural Gas Corporation (ONGC) among others in this sector. However, these companies together cater to only 25% of India’s crude oil requirement. The rest of the crude oil is imported. The crude oil is then bought by Oil Marketing Companies (OMCs), which handle oil from its crude stage till the time it is handed to the dealers in its refined form. Thus, OMCs take care of refining of crude oil into petrol and selling the refined petrol to the dealers. This sector also comprises of both public and private companies. However, the three PSUs- Bharat Petroleum Corporation Limited (BPCL), Indian Oil Corporation Limited (IOCL) and Hindustan Private Corporate Limited (HPCL) control around 95% of this sector; while the two private players- Reliance Industries and Essar cater to the remaining market. Dealers are individuals or businesses that own petrol pumps. Thus they are the final sellers of petrol to end users at retail prices, after adding taxes and their own margins. Daily Fuel Pricing: What to expect? From 16th June, public sector OMCs such as IOCL, HPCL and BPCL have rolled out daily price change mechanism in all their retail outlets across the country, in line with global practices. The prices are revised at 6 AM every morning at petrol pumps. Also, petrol pumps will now follow a system of marginal differentiated pricing resulting in different prices at different outlets of the same OMC, based on location. For example, a petrol pump nearer to the supply station may have a lower price than the one farther away. It won’t be exaggeration to say that the Price of Petrol & Diesel affect almost every Indian directly or indirectly. Such is the importance of these two that any increase or decrease in their price is widely discussed. 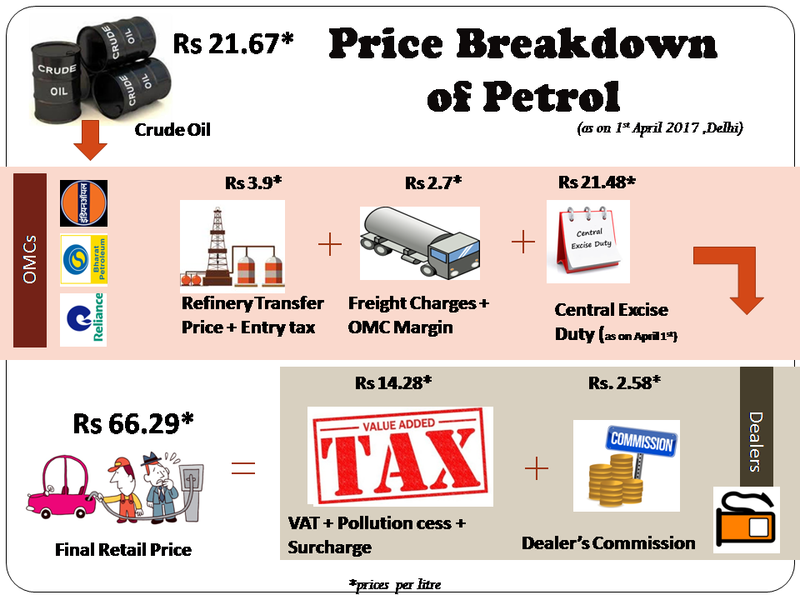 Ever since de-regulation, the prices change every fortnight based on the changes in the price of crude oil and changes in tax rate. While people at large follow pricing of these two commodities, they do not understand the structure of pricing, the components that add up to the final price. The above video is aimed at demystify the Petrol pricing. Retail Selling Price (RSP) of Petrol is determined based on a lot of factors. The average price of Crude Oil of the Indian Basket is calculated every fortnight. This price is calculated in dollars per Barrel. The price in Indian rupees is also dependent on the average exchange price for that fortnight. The Crude Oil is transported and refined to extract Petrol. The cost & freight charges, refinery charges are added to the price of Crude oil. This is called the Refinery Transfer Price (RTP). In other words, this is the price paid by OMCs (Oil Marketing Companies) like IOCL, BPCL & HPCL to the refineries. OMCs retain some margin and sell it to the Dealer (the owner of the Petrol Pump). All these prices add up to the final Retail Selling Price (RSP) of Petrol that reaches the consumer. There are differences in the price in various states because of the different VAT rate. The price also varies between a pump owned by different OMCs. These minor differences are because of the variations in margins & dealer commission. This entire process is explained in the above 75 second video. 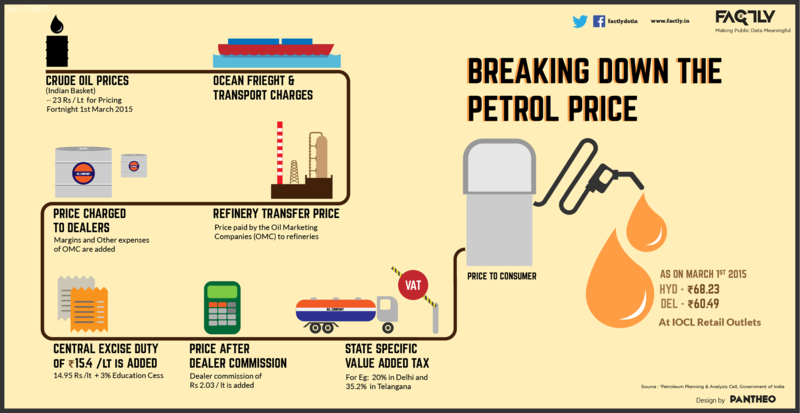 Here is an Infographic explaining the petrol price breakup starting from the price of crude oil till it reaches to the end consumer including the various components of pricing. Note: The data is as on March 1st, 2015.